Thanks to three underperforming newcomers, the fall blockbuster IT returned to top the box office with a paltry $17.3 million in the estimates, but when the actual numbers were released yesterday, it was actually far worse, with Kingsman: The Golden Circle coming out on top with $16.93 million, and IT dropping to second with $16.9 million. Kingsman 2's two-week reign will most likely come to a close this weekend with Blade Runner 2049 hitting theaters, armed with a wealth of Blade Runner buzz and strong reviews, making it an easy choice to win this weekend, even while going up against a diverse slate of newcomers like 20th Century Fox's The Mountain Between Us and Lionsgate's My Little Pony movie. Still, the R-rated Blade Runner 2049 should have no trouble topping the box office with a projected $51.6 million. Last month, the first box office projections put the Blade Runner 2049 opening weekend at north of $40 million, which, ironically, is more than the $32.8 million domestic lifetime total for the original Blade Runner movie, which includes theatrical re-releases. Still, that projection was made before the reviews came out, with the critics showering heaps of praise on the sci-fi sequel, earning an impressive 94% rating on Rotten Tomatoes, with just four "rotten" reviews out of 63 total thus far. Given the tendency for R-rated fare to out-perform its projections, a $51.6 million debut for Blade Runner 2049 is certainly not out of the question, and may ultimately prove to be too low, if the buzz keeps building until Friday's release. The R-rated Blade Runner 2049 is projected to debut in a whopping 3,900 theaters, but it's possible it could be pushed into the 4,000 theater range. 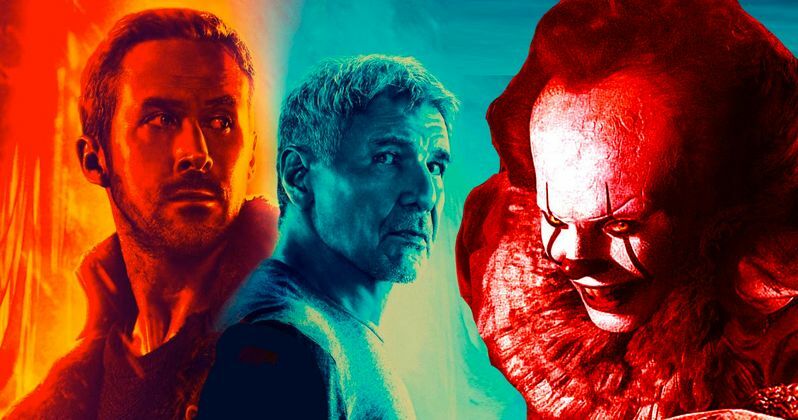 Only three R-rated movies in history have opened in more than 4,000 theaters, all released this year, Kingsman: The Golden Circle (4,003), Logan (4,071) and IT (4,103). While, in most years, a PG animated film like My Little Pony would be expected to easily walk away with the win, this year has proven beyond a shadow of a doubt that audiences are craving R-rated fare more than ever, and it's showing at the box office. Besides, My Little Pony is only expected to open in 2,500 theaters this weekend, with the PG-13 drama The Mountain Between Us arriving in roughly 2,900 theaters. We're predicting that the top 10 will be rounded out by The Mountain Between Us ($14.6 million), My Little Pony: The Movie ($13.5 million), IT ($10.1 million), Kingsman: The Golden Circle ($9 million), American Made ($8.8 million), The LEGO Ninjago Movie ($6.1 million), Flatliners $3.2 million), Battle of the Sexes ($1.9 million), American Assassin ($1.2 million). Also arriving in limited release are Vertical Entertainment's 2307: Winter's Dream, Dada Films' Architects of Denial, Parade Deck Films' Bad Grandmas, Well Go USA's Better Watch Out and City of Rock, Hanover House's Daisy Winters, BBC Worldwide North America's Earth: One Amazing Day, A24's The Florida Project, Freestyle Releasing's Generational Sins, Film Movement's Paradise, Good Deed's So B. It, Purdie Distribution's The Stray and Eammon Films' Una. Focus Features' Victoria and Abdul is also expanding to 750 films this weekend, but it may not be enough for it to crack the top 10. Looking ahead to next weekend, Box Office Mojo reports that there will be four new movies opening in wide release, with STX Entertainment's The Foreigner, Universal's Happy Death Day, Open Road Films' Marshall and Annapurna Pictures' Professor Marston and the Wonder Women. Also opening in limited release next weekend is IFC's 78/52: Hitchcock's Shower Scene, Bleecker Street's Breathe, Matson Films' The Departure, Fox Serchlight's Goodbye Christopher Robin, Indican's The Lucky Man, Parade Deck Films' Man From Earth: Holocene, Vertical Entertainment's The Secret Scripture, Freestyle Releasing's Swing Away and Super LTD's WASTED! The Story of Food Waste. Take a look at our projected top 10 for the weekend of October 6, and check back on Sunday for the official box office estimates.